'We Don't Planet' Episode 4: What's the Evidence for Dark Matter? 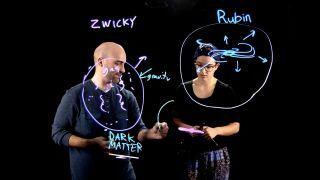 Paul Sutter and Anna Voelker discuss dark matter during Episode 4 of the astrophysics-video series "We Don’t Planet." The origins of our understanding of dark matter stretch back all the way to the 1930s, when Swiss astrophysicist Fritz Zwicky first started making X-ray observations of the Coma Cluster, a massive agglomeration of galaxies near the Milky Way. With an optical telescope a cluster of galaxies appears exactly like the name suggests — a bunch of galaxies. But X-rays reveal the presence of a hot, thin, tenuous plasma filling up the volume of each cluster, called the intracluster medium. When Zwicky went to measure the temperature of the Coma Cluster's plasma, he was surprised by its incredible hotness. Indeed, the plasma was too hot to be supported by the cluster's own gravitational pull: If the cluster is to be stable for billions of years (which it must be, in order for us to be able to observe it), then the gravitational pull of all the matter in the cluster must balance the expansive pressure of the hot plasma. Zwicky surmised that there must be hidden or "dark" matter to account for this discrepancy, but he didn't think much more about it. It wasn't until the 1970s when the concept of dark matter resurfaced. This time, Vera Rubin was studying the motions of stars within galaxies, and found that they were orbiting the galactic center too fast: there must be something "gluing" the galaxy together gravitationally; otherwise, the galaxies would've ripped themselves apart long ago. After studying even more galaxies, and returning to the observations of galaxy clusters, astronomers began to understand that the universe is dominated by an invisible form of matter that simply doesn't interact with light — dark matter. "We Don't Planet" is hosted by Ohio State University astrophysicist and COSI chief scientist Paul Sutter with undergraduate student Anna Voelker. Produced by Doug Dangler, ASC Technology Services. Supported by The Ohio State University Department of Astronomy and Center for Cosmology and AstroParticle Physics. You can follow Paul on Twitter and Facebook.